I always meant to read My Sister Lives on the Mantlepiece, Pitcher's first novel, but somehow never got around to it, it's still waiting unread on my shelves. 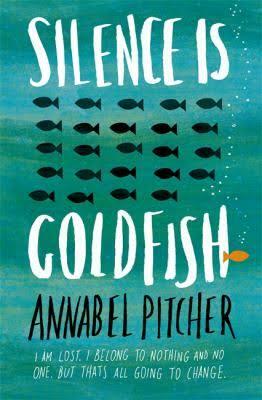 I did read, and enjoy, her second, Ketchup Clouds in my book group (we are adults reading YA fiction), so I had good expectations when I started Silence is Goldfish and I did mostly enjoy it, but couldn't quite be convinced with some aspects of the story. When the story opens Tess has run away from home and is thinking about the household's morning scenario in her head, wondering how they will react when they find out she's gone, except things very quickly go wrong and she heads back home to her bed before anyone even wakes up, but now armed with a plastic torch shaped like a goldfish. The torch will go on to have a major role in the story (this is the main aspect I wasn't convinced by), having conversations with Tess, while she's not talking to anyone else. Hence the title. You very quickly get to the crux of the matter, the reason she was running away - she's read something on her father's computer that tells her that he's not actually her father, and that his first feelings towards her when she was born were of disgust. Shocking. Destroying in an instant her previously great relationship with him. She is in such a state of turmoil that she can't find the words to communicate with anyone, so simply stops talking, refusing to speak or follow instructions. It's a great idea - I've long been intrigued by stories of people who have stopped speaking after undergoing some trauma and think it must be like taking control over one of the few things you can be in charge of, a strange sort of power. Tess's story is nicely complicated with its various layers of characters who each have their own story, and of course the complications of who her father really is. She starts to look at every significant male around her to see if he is potential father material, becoming quite obsessed with one possible candidate. Tess also has body-image issues - she's quite overweight, and friendship problems - she's told her dad that she's school friends with the most popular girl at school, but in reality that girl insults her constantly. She does have a good friend, Isabel, but Isabel's a bit odd too. I loved how all the characters wound around each other, drawing an ever-complex net around Tess until things get quite out of control and the truth has to come out. The only thing I had the problem with was that damn fish and couldn't help thinking there could have been a much more convincing way of getting the story to work without this unrealistic ploy. You can check out the author's website or follow her on Facebook and here's an interview from The Guardian website, about Silence is Goldfish.